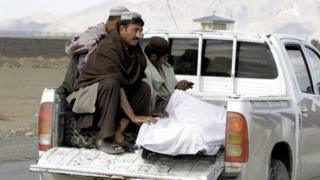 Dozens of people have been killed in a Taliban attack on a heavily fortified civilian and military airfield in the southern Afghan city of Kandahar. At least 37 people, including many children, were killed in the clashes, along with at least nine militants, the defence ministry said. A number of hostages were seized in the 26-hour attack but the Afghan army says it has now regained control. This is the latest in a series of ambitious raids by Taliban fighters. The Taliban briefly seized the northern city of Kunduz in September. The group described its fighters as "martyrdom seekers" who had launched "thunderous attacks on foreign and hireling personnel". The attack continued until one gunman who had held out on his own for several hours was killed late on Wednesday. At least 35 people and one Taliban fighter were also injured in the attack, the defence ministry said. The airport compound houses Afghan military and civilian sections as well as a Nato base. Tolo News TV said the insurgents were dressed in military uniform and were equipped with light and heavy weaponry. They breached the first gate and then entered an old school building, trading fire with security forces. Witnesses reported that some of the militants took families hostage and used them as human shields. They said they could hear Afghan soldiers calling on the fighters to let the women and children go. Kandahar airport director Ahmadullah Faizi told AFP news agency that some passengers waiting to board a commercial flight to India had been trapped inside the airport's civilian terminal, at some distance from the fighting, during the attack. US Army Col Michael Lawhorn said the Taliban fighters "never physically entered the airfield". There were no coalition casualties. Correspondents say the attack is a huge security failure because the attackers were able to smuggle weapons into an area supposed to have been made secure by the Afghan National Security Forces (ANSF). Kandahar army commander Sher Shah told reporters that radio intercepts had found that some militants were speaking in Urdu - a language more common in neighbouring Pakistan. Afghan officials frequently blame Pakistan for the unrest. The statement by the Taliban claimed that they had killed up to 80 soldiers. This figure could not be verified. Separately, the Taliban claimed to have captured Khanashin district in southern Helmand province. A local official confirmed the district had fallen. Militant violence has increased across Afghanistan since the departure of most Nato and US forces last year. The latest violence came as Afghan President Ashraf Ghani called for help to defeat terrorism, at a regional conference in Pakistan. Mr Ghani condemned the Kandahar attack as cowardly and expressed his condolences to the families of the victims. Afghan Foreign Minister Salahuddin Rabbani, speaking at the conference, called on Pakistan to help restart stalled peace talks with the Taliban.